Elliott takes ’12 Jamaica Open! 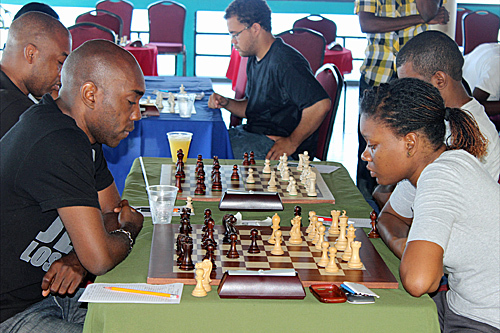 The Jamaica Chess Open took place recently at the Negril Escape Resort and Spa. The event, which is the flagship open tournament of the Jamaica Chess Federation, was staged outside of Kingston for the first time in over a decade. The ultimate goal is to spread chess, the fastest growing sport in Jamaica, to all fourteen parishes. The tournament boasted the highest prize fund for any open event this year and consisted of three sections open to amateurs and players of various ratings. International players included Americans National Master Devlin Sinclair and Tyrell Harriott battling among top local players, notably FIDE Master Warren Elliott and current national co-champions Damion Davy and Andrew Mellace. Six-time national champion Warren Elliott successfully claimed first place after defeating Harriott, Shreyas Smith and National Master Ryan Blackwood. He finished on 3.5 points from four games as a result of a hard fought draw with ten-time women’s champion Deborah Porter in the penultimate round. FIDE Candidate Master Damion Davy, and National Masters Russell Porter, Andrew Mellace, Peter Meyers, Devlin Sinclair and Ryan Blackwood all shared second prize with three points. Porter was awarded the silver medal based on tiebreak. Warren Elliott (front, left) was held to a draw by Deborah Porter (front, right) at the 2012 Jamaica Chess Open, however Elliott defeated the rest of his opponents to claim first place. In the section for intermediate level players, Kevin Merritt won with a perfect score of five points from five games while Donavon Merritt, Nathan Belifante and Rochelle Porter shared second place with 4 points each. Queston Warren was crowned the top amateur after securing an immaculate score of six points from six games in the ‘Amateur Section’. Oneil White, Nathalene Gardner and Davini Tulsie trailed closely behind and tied for second place. The tournament was sponsored by the Negril Escape Resort and Spa, the Rockhouse Hotel, the Magnificent Chess Foundation, FIDE Master Grantel Gibbs and the Westmoreland Chess Association which was officially launched at the event. Damion Davy vs. Sheryas Smith, Sicilian Najdorf, 2012 Jamaica Open, 1-0, 33.